Are you researching some duck species? 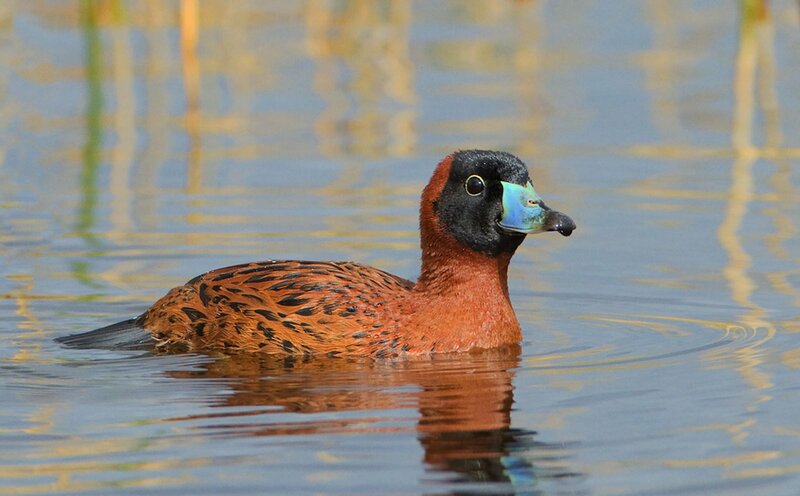 We’ll tell you about one: the Masked Duck. A widespread species, although it is quite unknown to the world. In other areas it is known as masked duck or iron duck. Its scientific name is nomonyx dominicus. A species of anseriform bird of the antidae family. Inhabits Central and South America, presents in the Caribbean Antilles. It lives in tropical marshes, in fresh water, where there is floating vegetation. It is usually on land 800 meters above sea level. It is a large bird, measuring between 31-16 cm in length. It presents a slight sexual dimorphism that allows to differentiate the female from the male. It weighs about 300-400 grams. It is characterized by a reddish brown color, with a black crown and a light blue beak. On the back, the feathers are reddish brown with black spots, while the wings are brown. The secondary feathers are white, only visible during the flight. Females, on the other hand, have a striated back, with two stripes crossing their eye area, one above and one below. An identity mark that makes it easy to differentiate them. Although he is a very good flyer, and one of the best of the species, he spends more time in the water. In fact, his name comes from spending a lot of time diving underwater to get his food. Its food is composed of seeds and aquatic plants that it gets from the bottom of the water, but it can also be fed from the surface plants. Occasionally, it may consume crustaceans and small aquatic invertebrate insects. It is not known when the breeding season begins, nor whether the pairs of this species are monogamous. This doubt is due to the data obtained from some nests. This species usually lays three to five eggs, but nests with up to 12 eggs have been seen. This suggests that they are polygamous pairs or that the females share the nest and one is in charge of the incubation. Whether the father participates in the incubation is a complete mystery, although most species in the duck family leave this task to the mothers. The eggs hatch after about 28 days of incubation. When the chicks are born, they go to the water with the mother, where she feeds them by regurgitating a mixture of aquatic plants, crustaceans, aquatic invertebrate insects and some seeds. It is not known how long it will take to leave the nest. A duck takes more than two months to fly. However, parents are not allowed to leave the area.